A one-point win for the home side tonight in Tralee. Tempers flare at the final whistle in Tralee. NOT QUITE AS sparky as the corresponding fixture two years ago but there was still plenty of fire and fizz in Tralee this evening as Kerry maintained their winning start to the league and consigned Dublin to a second defeat in three games. Two years ago Paul Mannion conjured an additional time equaliser for Dublin to maintain their record making unbeaten run at the time, but this time Peter Crowley was the local, if unlikely, hero for Kerry with the corner back punching over a 74th minute winner at a packed and partisan Stack Park in Tralee. Just under 12,000 were in Tralee to see the league champions beaten by their old nemesis who were earning just their fourth league wins in 11 meetings over Dublin this decade, and just like that drawn game in Tralee two years ago this contest wasn’t found wanting either. One got the sense from Kerry manager Peter Keane that the manner of the win was as important as the win itself, not least as Kerry had to dig deep against the 14 men of Dublin in the final quarter to make it three wins from three. Kerry led by five points, 1-15 to 2-7 after 42 minutes, and backed by the majority of the 11,982 partisan crowd, they were well positioned for a rare victory over Dublin these days but the visitors kept their best football for the last quarter as they went about reeling their opponents in. Even Mick Fitzsimons’ red card after 60 minutes barely troubled Dublin in that last 15 minutes, although in hindsight the absence of the Cuala defender left them sparse at the back as Kerry pressed for that winner in additional time. Despite heavy and persistent rain from the start both teams played front-foot football from the first whistle with Kerry showing early intent with full back Jack Sherwood getting forward for the first score inside two minutes, and the high tempo never abated after that. 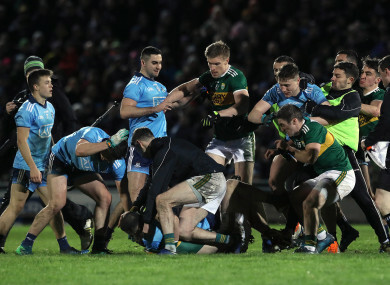 Dean Rock’s converted free in the third minute settled the visitors but Kerry kept the foot to the floor and led by two points on three occasions by the 20th minute only for Dublin to half the deficit each time. Stephen O’Brien’s goal prodded in from Dara Moynihan’s dangerous high ball in in the 23rd minute made it 1-6 to 0-5 but the Kerry supporters had barely taken their seats when Con O’Callaghan sailed through the cover and with the help of a deflection saw his low shot creep past Shane Ryan to make it a one-point game again. Kerry responded with points from Tom O’Sullivan, Dara Moynihan and two Sean O’Shea frees but Dublin struck back with a Paul Mannion goal to make it 1-11 to 2-6 in Kerry’s favour at the break. The pace never dipped after the restart as another four unanswered Kerry points saw them lead 1-15 to 2-7 after 42 minutes but there was never the sense that a callow Kerry team had put Dublin away. Points from James McCarthy, Mannion and Dean Rock with his fifth of the night cut the gap to two points before Dublin were reduced to 14 with Fitzsimons’ red card, which brought the best out of the Dublin with points from Brian Fenton, Mannion and two from Cormac Costello leveling it at 1-17 to 2-14 before Crowley fisted the winner to keep Kerry on maximum points from three games. Scorers for Kerry: Sean O’Shea 0-8 (0-6f, 0-1’45′), Stephen O’Brien 1-1, Dara Moynihan, Paul Geaney 0-2 each, Peter Crowley, Jack Sherwood, Tom O’Sullivan, Gavin O’Brien, Tommy Walsh 0-1 each. Scorers for Dublin: Paul Mannion 1-2 (0-1f), Dean Rock 0-5 (0-4f), Con O’Callaghan 1-0, James McCarthy 0-3, Cormac Costello 0-2 (0-1f), Brian Fenton, Darren Gavin 0-1 each. Email “Crowley proves Kerry's unlikely scoring hero as they defeat Dublin in league cracker”. Feedback on “Crowley proves Kerry's unlikely scoring hero as they defeat Dublin in league cracker”.